Cardinal Vincent Nichols this week shared a platform with the Archbishop of Canterbury to take part in an interview with the pioneer of the Alpha Course, the Revd Nicky Gumbel. Figures from Alpha show there has been an increase in the number of their courses – an introduction to Christianity – run in Catholic parishes and chaplaincies in the United Kingdom to 112 in 2014, compared with around 50 the year before. Ninety-five of the courses run last year were brand new. 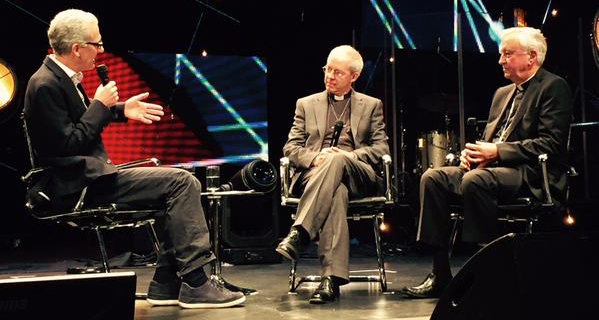 The cardinal and Archbishop Justin Welby were interviewed as part of the Alpha Leadership Conference which took place this week in the Royal Albert Hall and the Hammersmith Apollo in London. Among those attending were Catholic bishops from across the world. Alpha, based at the Anglican church of Holy Trinity Brompton in west London, is now run by more Catholic parishes worldwide than Anglican ones. The Church in England and Wales is this year undertaking an evangelisation drive, Proclaim ’15, which will culminate in a conference for its representatives in Birmingham in July. The Revd Gumbel will be one of the speakers at the event. While Alpha is popular in countries such as France, it has struggled to make an impact in the Catholic Church in Britain in recent years. However Alpha has been part of the core group organising Proclaim and says that since Pope Francis’ apostolic exhortation Evangelii Gaudium there has been an increase in requests to use Alpha by Catholic parishes and dioceses. Alpha has a specific section that has been devised for Catholics. During the interview, Cardinal Nichols said his priority as a church leader was relationships, pointing out that priests in his diocese are like family and therefore he does not have the option of sacking them. He stressed that the quality of relationship is more important than a particular idea or objective he may be trying to achieve. He explained that unity among Christians was something that would be received in two places – “on our knees and in service to the poor”.